So I started another blog. At least this one is kind of an offshoot of an existing site, not another entirely new website. It’s the blog of the Western Nevada Historic Photo Collection, the WNHPC Blog. I hope to use it to write about building the collections of the WNHPC, and to highlight interesting photos out of the collection. And of course I’ll be putting really interesting photos here too, but I’m hoping to make that a place where I can do all photos all the time without it getting overwhelming. You can follow the blog, or subscribe to its feed. I have one big post up already, about a major addition I just made to the site. Today I added the Lawrence & Houseworth collection, or at least a part of it. The L&H is a collection of views of California and Nevada during the mid 1860s, about 1,500 in all. I was sifting through the collection and found a sequence of 118 shots that chronicle an expedition from Placerville to Lake Tahoe and Virginia City. The photographer made several stops along the way (what is a three-hour drive for us probably took them a week or two by wagon) and took tourist photos of the interesting sights from the trip. 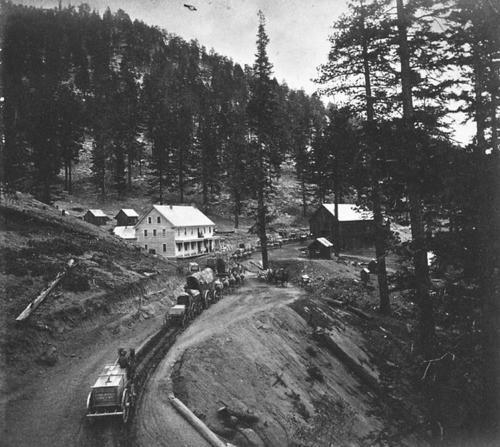 Then they reached Virginia City and got to business photographing main street and the mines. It’s a fantastic sequence, and I just had to put up the whole thing. To see it, start here and click on the Next button at the bottom. There was one set of photos that was so funny I had to give them their own post.